Green Bay's Southwest High Schools art club has some talented artists, but their talents are not outweighed by their giving and compassionate hearts. "Kids from less fortunate areas of the world, we get sent a picture of them, and we create some sort of art, around the child and send it back so they feel more hopeful," said freshman Kayla Fuller. 15 students in the art club want to make a difference. For the past two months they've been working hard to give orphans in the Philippines an original portrait of themselves. "My picture was of a little eight year old boy, his name is Marciano his favorite was blue, and that's all the information I got of him," said Fuller. It's called the Memory Project; the purpose is to provide a special gift that shows kindness and peace. "These kids get to think outside of Wisconsin, the school building, have sympathy for these children in other situations and make a connection to someone across the world," said art teacher Jon Taft. Taft said he's amazed at how much his students have embraced this project. "I want the spotlight to be on the kids, they're the ones who stepped up and volunteer to give of themselves," says Taft. GREEN BAY, Wis. — Green Bay's Southwest High School's art club has some talented artists, but their talents are not outweighed by their giving and compassionate hearts. "Kids from less fortunate areas of the world, we get sent a picture of them, and we create some sort of art, around the child and send it back so they feel more hopeful," said freshman Kayla Fuller. 15 students in the art club want to make a difference. For the past two months they've been working hard to give orphans in the Philippines an original portrait of themselves. "My picture was of a little eight year old boy, his name is Marciano his favorite was blue, and that's all the information I got of him," said Fuller. It's called the Memory Project; the purpose is to provide a special gift that shows kindness and peace. 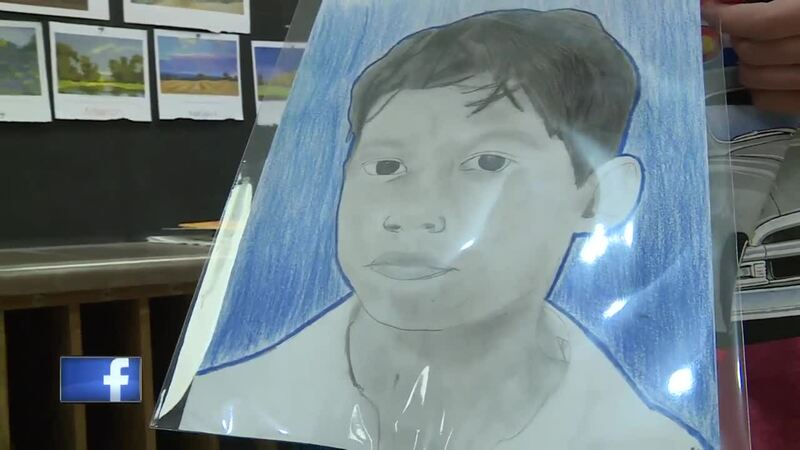 "These kids get to think outside of Wisconsin, the school building, have sympathy for these children in other situations and make a connection to someone across the world," said art teacher Jon Taft. Taft said he's amazed at how much his students have embraced this project. "I want the spotlight to be on the kids, they're the ones who stepped up and volunteer to give of themselves," says Taft.